My Design Within Reach FAF Notepad arrived, a wonderfully large, lightweight metal notepad with 200 sheets of paper that can be refilled. I was very surprised to see the Exacompta label and two familiar-looking pine trees. A nod to the days before iPhones and PDAs, the FAF Un Bloc Pads are a classic desktop design. 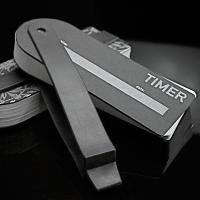 Available in two sizes, these durable and minimal pads stay put on your desk or table. Brass washers secure 200 sheets of unlined paper on a steel backing, which has rubber feet to prevent slipping or damage to surfaces. Made in France. 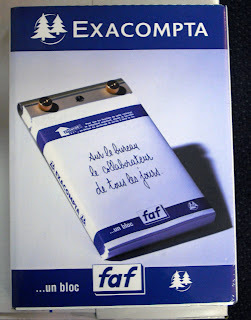 Quite an interesting item from Exacompta, I'm wondering if these are available anywhere else and if the pads (which like the FAF are on the higher-priced end of the spectrum) are sold somewhere in NYC as well. The Red Book, currently on display through February 15, 2010, is an amazing journal written between 1913, just around the time of Jung's break with Freud (an event that was among the precipitants of Jung's mental breakdown), and 1930, when he seems to have simply finished. The physical journal is about 8.5 x 11, a specially-made red leather book with pages of ivory vellum that have been scored so that writing will be even and perfectly horizontal. The Red Book actually started out as numerous journals (known as the Black Books) kept by Jung, then refined, re-written, and re-drawn into the final Red Book, the Liber Novus. At several points Jung thought of having the Red Book published, but was somewhat embarrassed by writings, which came about using the technique of Active Imagination. What was risque in 1930 seems quite banal in 2000, and Jung's heirs eventually agreed to allow publication. During the period in which he worked on this book Jung developed his principal theories of archetypes, collective unconscious, and the process of individuation. It is possibly the most influential unpublished work in the history of psychology. More than two-thirds of the large, red, leather-bound manuscript’s pages are filled with Jung’s brightly hued and striking graphic forms paired with his thoughts written in a beautiful, illuminated style. Jung was fascinated by the mandala—an artistic representation of the inner and outer cosmos used in Tibetan Buddhism to help practitioners reach enlightenment—and used mandala structures in a number of his own works. Jung’s first known mandala-like work, Systema mundi totius (1916), will be on display. Created between 1914 and 1930, the Red Book has never before been seen in public, outside the circle of Jung’s family and very close friends. Alongside the 95-year-old volume will be a number of oil, chalk, and tempera paintings and preparatory sketches related to it and other original manuscripts, including the Black Books, which contain ideas and fantasies leading up to the Red Book. The exhibition coincides with W.W. Norton & Company’s publication of a facsimile and translation of the Red Book. I went back in late December with several friends who came in for the day specifically to see this Red Book I'd been going on and on about. The German Gothic script and beautiful drawings (mandalas, figures, balls of light) have been made available for review and reflection, but there is nothing that takes the place of seeing the original. Jung's Red Book is in the basement of the Rubin, and unfortunately no pictures are allowed (and there are three to four guards at this exhibition to enforce that rule). The space, which is directly below and open to a very attractive blonde-wood-and-stainless-steel cafeteria, is quite small. The journal is off to the side, while the main space is a recreation of what seems to be Jung's office space, with two copies of The Red Book available for perusal. There is something wonderful in thinking of him writing out his thoughts hunched over this desk, and I have to wonder what kind of pen he used. Along the walls of the exhibit space are sketches that Jung drew and gave to friends or used to illustrate his publications. Spending time at this exhibit made me re-think Jung and his theories, and sent me on a quest to learn about quite a few of the ideas he articulated during this period (and are found in various forms in The Red Book), most especially Active Imagination. Next to the Red Book is one of the most amazing analyses I've ever read, and I'll leave it as the parting thought of this post. Christianity and the future religious development of the West. In addition to addressing these goals and their broad implications, the manuscript serves as a record of how Jung rediscovered his soul and overcame the malaise of spiritual alienation. He accomplished this by creating a new image of God and established a new psychological and theological cosmology. The scarf is finished, made with a seed stitch using Patons Shetland Chunky yarn in Imperial. Now to make the matching hat! One of my workhorse pens is this Rotring Surf with a medium nib, purchased as a set of four on eBay. It's a simple pen with a plastic barrel that comes in orange, blue, green, and yellow; the pen takes either a cartridge or converter, and the cost was bout $6 or so per pen. They have a great hand feel and the nib doesn't fight the paper or skip when writing. Also, the line from this medium nib looks good--one of the few medium nibs I really like the look of on paper. The Rotring Surf is a simple writing pleasure, well constructed, and something to add to your collection of lower-priced pens. Some years ago a very close friend died and I inherited her Rotring 900 ballpoint pen. It's a beautiful piece of sleek matte German engineering; the pen is larger than most and has an amazing knurled barrel. The pen is no longer manufactured, but I did find some selling on eBay--including fountain pens, which I kept an eye on hoping to snag one for less than $100. And so I did, a slightly used 900 fountain pen with a broad nib. Which is when I discovered I'm not a fan of broad nibs, and wanted a fine point or, at most, a medium. I asked around on StyloForum and read through Fountain Pen Hospital, waiting until after the holidays and the post office crunch to get in touch with Daniel Smith at Passion du Jour to talk about having the nib ground. What I thought would be an easy request on my part of going from a broad point down to a fine took a turn when Dan mentioned a cursive italic nib. While I'm usually plain vanilla in my choices, suddenly the thought of having a slightly exotic nib at my fingertips was very appealing. After a few emails, I sent the pen off to Dan and waited. In all, it took a little over a week to get my Rotring 900 with the cursive italic nib. It's amazing, Dan did a wonderful job on it in no time at all and I love writing with it. 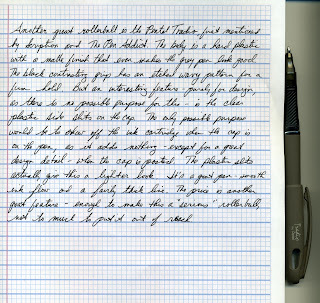 While I never cared much for italic pens before I'm absolutely thrilled with this, and can't write enough. I'd recommend Dan highly for anyone looking for help with a nib. My Pilot Custom 74 is very scratchy, and I'm planning on sending it to Dan for some finishing. These looks interesting, from Design Within Reach: the Bouquet of Notebooks series, reasonably priced at $20 for the set and available February 26, 2010. 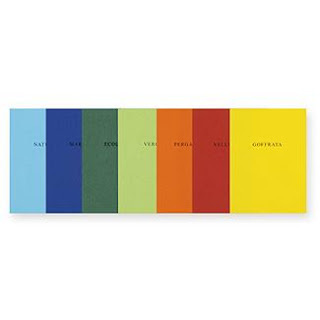 From the company that makes the paper for the Euro note comes this bouquet of seven compact notebooks. Each pocket-sized notebook has a different color and different type of paper – from vellum to graph paper – to suit all types of creative impulses. Designed to be enjoyed by everyone from the consummate doodler to the serious paper geek, it’s a compelling and brightly colored assortment. Update: I came, I saw, I ordered. PB Note: Jack emailed me regarding the Jinhao fountain pen he was thinking of purchasing, and I asked if he would review the pen. 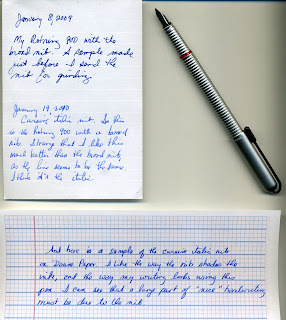 It's a great piece, for several reasons: it's well written, the photos (by Tom Darland) are crisp and clear, and it's about a fountain pen that is easily available to anyone with a laptop and a credit/debit card. Guest submissions are welcomed on this site, if you're interested. In the meantime, enjoy Jack's review. 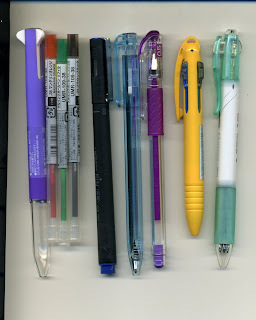 A few low-end A. T. Cross pens at Staples, and a handful of Pilot Varsity pens at the local university bookstore, the latter sold mostly to foreign students. That’s what I found after scouring gift shops, office supply stores, jewelers, bookstores, and Mom ‘n’ Pop specialty retailers in the Youngstown-Warren, Ohio area. You mean an area of about 600,000 people can’t support a better-quality pen and stationery store? How about a mall kiosk or display space piggybacked onto an existing retailer? Some months earlier my Parker 75 had developed a quarter-inch wiggle between the cap and barrel. I’ve described the 75’s line on Pocket Blonde as “opulent”. “Buttery smooth” is another description. I thought of getting a 75-replacement, while I fiddled with a ginned-up home pen repair. That’s how I crisscrossed our metro area looking for an FP retail display that doesn't exist. You probably know the down side of some FPs: skipping, blotching, persnickety filling gizmos, scratchiness, etc. Workaday FPs run from 4-200 times the price of a ballpoint or gel pen. Their up side is a diversity of inks, a more expressive writing line, an assortment of nib dimensions and materials, barrel diameters to suit the individual penman, and much more. Are they worth it? Enter Mr. Norman Haase of HisNibs.com. A well-regarded e-tailer with more than ten years experience, Mr. Haase makes a market in medium- and high-end Chinese pens. Think Chinese goods are junk? Think again. Chinese products are moving quickly to the high quality/low price quadrant of the price-quality matrix. That’s the box Japanese and German manufacturers once occupied. With a Parker 75-equivalent weighing in at $200 or more, I wanted something more moderately priced. Could HisNibs.com deliver? I inked up with Private Reserve’s Velvet Black, also sold by Mr. Haase. Decorated with scrollwork and the Jinhao name, the large steel nib is firmish. This torpedo lays down an extraordinarily smooth line on Staples bagasse paper, Rhodia and Alvin notepads, legal pads, and even, with trivial initial skipping, no-name inkjet paper I’d cannibalized for scratch pads. Fit and finish appear excellent. Pocketability is fair. No blotching. Prestige factor unknown. This lacquer-over-brass pen is nicely balanced, and has a heft that many will enjoy. Am I happy with my purchase? Yes. Would I buy from HisNibs.com again? Yes. And, Norman’s handwritten letter folded into an origami envelope is a gem. You can buy Jinhao less expensively from other well-regarded e-tailers. What Norman promises is an examination and tweaking of the nib if it needs it before the sale. That’s the kind of extra effort that builds confidence and repeat sales. Back in the 16th century, Europeans had finally thrown back the Caliphate. Mongol invaders had been repelled for good. Bristling with energy and fresh ideas, Europeans built themselves into an economic powerhouse. China, which until then had been among the wealthiest of nations, was eclipsed. Until recently, that is. My friend C has fallen in love with the Doane Paper notepads, and the one I gave her has become a very popular item in her media arts classes. But she has had one request: holes, so she can put her class notes in a three-ring binder. We tried doing it ourselves using an industrial-sized three hole punch but couldn't get the notepad to fit through the slat. So C emailed Chad Doane, and was surprised and thrilled when he emailed her back with a response. Unfortunately, holes would increase the cost of the notepads, but if there was demand then it would be considered. There must be another way, right? 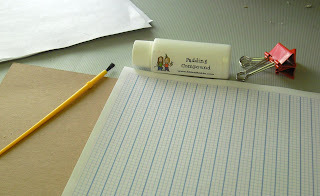 How about making a notepad--it can't be that hard. Fortunately Chica and Jo have a step-by-step guide on making your own custom notepads and sell the padding compound (which looks and smells very much like Elmer's Glue) and other things to get you started. With the padding compound and a small paintbrush on hand, I then needed the grid+lines paper. Easy enough, as Doane Paper has a download for printing 8.5x11 grid+lines paper. With a bit of photo shopping and the use of a laser printer I had 100 sheets of "Doane Paper" to hole punch and glue to the chipboard backing. This wasn't hard, but it did have it's headache-y moments. The paper wouldn't line up, then the pressure on the paper wasn't hard enough to push everything down smoothly. In the photo above, I'm brushing padding compound onto the edge of the paper; on top of that is a huge directory that I needed to add pressure to keep the paper smooth while I glued it together. The first pad came out pretty well and I gave it to Connie, then started on my own. 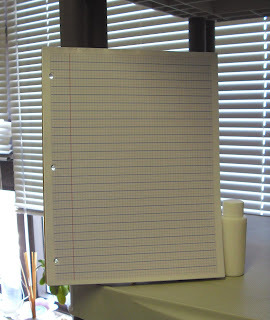 And there is it, a Doane Paper large notepad with holes for a three-ring binder. Mine came out slightly askew, as I didn't line up the paper quite right. But all in all, a fun project and as I have lots of padding compound left I'll be making more. The paper used is regular 20lb photocopy stock, about 75 gsm and not exactly Clairefontaine or Rhodia. But I have a ream of 28lb clay-coated laser printer paper on order, and so I'm looking forward to another round of notepad-making. Small black notebooks--Moleskine? And he carries around fountain pen ink in his pockets! Raven ink sounds interesting. The beginner's knitting course ends this Saturday, and I am almost finished with my scarf in the seed pattern using Paton Imperial yarn. I've signed up for intermediate knitting which begins in two weeks time, and our instructor has promised to show me the basics for making a pair of socks. 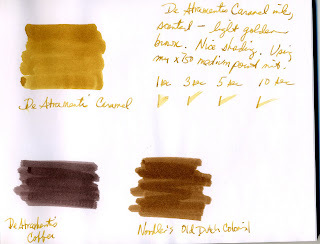 I bought the De Atramentis Havanna Ink thinking I could us it to make my brown inks warmer, and finally got around to swatching it for a review. And I put De Atramentis Caramel next to it for a comparison, thinking the latter would be darker. What a surprise! Athough this picture isn't the best of the ones I took, the entire paper is in sunlight and you can see the swatches entirely in natural light. If there is a difference between Havanna and Caramel, I can't see it. All writing is in Havanna, usng a Hero 266 fine nib. I love the color, which is a good thing as I now have two versions of it--one scented, one plain ink. If this color is of interest to you but you don't want to buy a scented ink, then Havanna is for you and it's $1.50 less than Caramel. I wonder if there are other De Atramentis duplicates, one scented, higher cost ink and one plain lower cost ink? fountain pen. I finally ordered one from JetPens, in a sedate gray color, and am now getting around to my own few words on the subject. It's a great rollerball, glides smoothly over the (Doane) paper, and has some nice design features. The hard plastic has a matte finish that's a touch silky, while the grip sports a wavy design that allows for a firm hold and no slip. I love the clear plastic windows on the side of the cap that allow you to see the pen tip, absolutely useless for anything but adornment. That's an interesting feature, as is the way the body of the pen nips-and-tucks in to accommodate the cap when posted. I've been busy since the first try at Spencerian, but thought I'd better practice or I'd forget what the difference between 1, 2, and 3 are and how to make them. Continuing with the small letters are v, o, au, and e. Again, looking at this on the paper and actually doing it with a pen are two different things. I was going to use my Namiki Falcon II metallic, but then realized I had been warned not to use a flex nib in the first stages of writing. So I pulled out my Namiki fine point black celluloid with Iroshizuku's Tsutsuji Azalea ink and sat down to do a few strokes. I have to say that I didn't like most of what I'd written out. I've circled a few that I though looked passable. In the first picture of the lowercase v, a few on the left side seemed to be good, while the rest were merely decent. I kept having to remember the strokes of the v: 3-1-2-dot-2. I usually give up and just intone the letter in my mind ("veeee, veeee, veeee") and rely on my first grade Catholic school cursive writing lessons to get me through. Lowercase o is interesting, the width is one-third of the length. I haven't measured my own, I'll leave that for later. I like the "opposite sides equally curved," wondering what other options their might be. The lowercase au was fun to do but looks awful. I'm not used to pulling the letter u all the way up to the top so as to be the same height as the lowercase a. To me it looks like a modified w, and I found I was really uncomfortable and didn't do it. I wonder if there is some time of writing memory in the hand, wouldn't be surprised if there were. Then we come to the letter e. I love the instructions: width one-third of space; loop two-thirds of length. I really had to think about the admonition to turn short as possible at top and base without stopping. It's a think loop, like a roller-coaster--why stop at the top and base? (2-stop, wait, what's this?-3-down to the base, where am I?-2-finished?) Well, I guess. Finally, I did connect a few of the letters to try and write an actual word or something like it. To me, writing vau felt forced and not natural. I'm thinking that this style of writing needs to be practiced every day for an hour or so, as I would have done 50 or 100 years ago. I'll add it to my list, and find some time. Onward to more letters, and then I'll be finished with book 1. 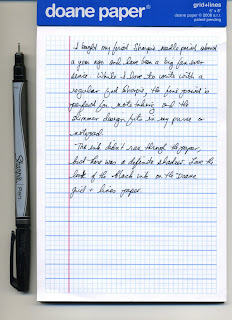 I haven't done any reviews on either the Sharpie Fine Point pen or Doane Paper as there are already great reviews available, such as those at OfficeSupplyGeek or The Pen Addict. So this is basically a fan appreciation post. Start with the Sharpie Fine Point pen. Whoever thought of this deserves a raise. The Sharpie pen was always great to write with, on any surface. 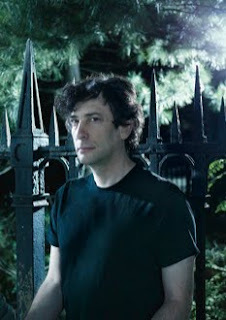 But it was thick and stubby and the point was too wide for fine writing. Along came the Fine Point and changed all that. A permanent marking pen in a sleek design that fits easily into purse or pocket, with rich black ink that doesn't soak through the paper. Then there is Doane Paper, the ultimate Grid + Lines experience. I've had a number of people in my office flip over my pads, idea journals, and stoplight series. They love this paper, and have chipped in on orders to get to the $40 free shipping limit. I don't know what it is, but I've discovered that a few of the crowd I work with are paper fanatics and are now seriously in love with Chad Doane (especially one colleague who recently emailed him with a question--she could not believe he emailed her back! I told her so, lol). We've been poring over the new Flap Jacket wire bound pad, and debating on punching holes for adding to three-ring binders (I'm neutral, others are pro especially after we tried an experiment involving a notepad and an industrial grade three-hole punch in my office that didn't work out too well). I'm now used to people coming into my office and gasping, then pointing to my desk at my Doane Paper small notepads. Or the commotion I can make when I go to a staff meeting and pull out my Idea Journal to take notes. One or the other, a Sharpie Fine Point or a Doane Paper pad, would be wonderful. The two together are heaven, and a few of my favorite things. 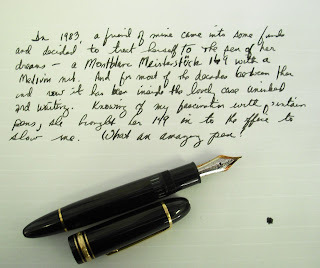 A friend at work brought in her Montblanc Meisterstuck 149 fountain pen for me to play with, as she's been seeing many of my recent purchases and talking pens with me. She bought it in 1983 as a special treat to herself, and hasn't inked it more than a few times. It's been in the box and unused for about the whole time she's had it; the look of horror on my face made her feel like she should start to use it, so she thought I'd inspire her. What an amazing pen. This is truly a cigar, or as I usually put it, a Robber Baron style pen. The nib is about double the size of any of mine, and while it's a medium point it looks to me like a broad. And the flex! I can't believe how much flex this nib has, even my Namiki Falcon II isn't as flexible as this. I'm beginning to see how writing with a fountain pen was an entirely different experience even 25 years ago. The only problem I had was more because of the lack of use: the ink wouldn't flow smoothly out of the pen, but started and stopped (let's not get into how long the piston filler took to pull the ink). Of course, once I gave it back to my friend both inked and used, she immediately started writing away quite happy to play with it again. I wrote a few sheets, but didn't really get the hang of the pen. Then I noticed something that could account for that: my friend is a lefty, and the pen flexed and glided specifically for her hand. Glad they are back together, I imagine I'll be seeing an amazingly large black pen on her desk from now on. I have quite a few notepads at work for jottings, calculating, and doodling, but my favorite is my Whitelines BIG Orange Glue A4 Squared Pad. It's heft alone denotes both seriousness of purpose and eccentricity, as it seems to demand the question: you write so much you need a pad that big? Well, no. But I love Whitelines notepads (I also have an 80-sheet A4 Squared Pad and several mini-notepads I carry around) and like to see the surprised looks when people see the gray background and white lines. As for BIG Orange, it has many uses in my office only one of which is writing. BIG Orange is 600 sheets of 8 x 12 Whitelines paper, a full ream plum 20% more and slightly larger than letter size. It's gray-and-white scheme make writing easier, as nothing really gets in the way of the words and figures. It's also a fantastic arm rest and mouse pad, rounding out the trinity of needs for my right side of the computer. When I need to go to meetings smaller pads accompany me, some Rhodia, some Whitelines, some Muji. BIG Orange is my go-to desk pad, keeping me from having to look all over for paper for a note or a doodle. With the orange glue the colors all fit into one great notepad for the paper lover. You may not want a notepad this large, even if it's a great investment. Fortunately Whitelines A4 notepads comes in an 80-sheet alternative form. Pentel of America is celebrating National Handwriting Day on January 23, 2010 by having a contest. Describe how you declare your independence, what independence means to you, in 500 or less handwritten characters and submit to Pentel of America. Five (5) people will be chosen by Pentel and given their own Independence Day. See Pentel's website for the contest rules and information. 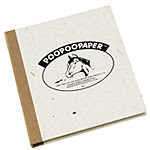 The website Uncommon Goods carries some really unique items, but one that got may attention was the journal made out of horse manure. Handmade? I'm not sure I really wanted to know that detail, but it's definitely...well, something. There are also journals and notepapers made from cow and elephant dung, and for those looking for a little something to brighten the room there are paper roses made from elephant manure. The Charles & Marie store is having a 10 day sale (this is day 5), where every day they take an additional 5 percent off items in their sale section. The coupon code at checkoout is 10DAYSALE. The pen clip is out of stock, but maybe a sketch pet notebook, shown above? Another of the De Atramentis scented inks I wanted to try was Caramel, which turned out to be a light golden brown and very much a color I've imagined but couldn't find. The caramel scent isn't as strong as Coffee, but there's definitely an urge for a piece of candy. And like the Coffee the scent only lasts 5 to 10 minutes. It dries reasonably quickly, and isn't as wet as some inks I've used. This was tried out in my x750 Legislateur with a medium nib, and with the larger nib size you get a sense of how nicely this ink shades. I've compared it to the De Atramentis Coffee and the Noodler's Old Dutch Colony Sepia ink to get a better sense of the lightness of this color. I bought some great looking Xeno ballpoint pens at Staples even though I'm no longer a fan of ballpoints, thinking that I would refill them with a gel ink cartridge. How difficult could it be to find a 1.0mm gel ink refill that would fit this pen? And the perfect place to look would be Kinokuniya; friends were due in for the day, and it's a short walk from the Port Authority. My friends could see one of the great Japanese specialty stores in NYC, and I could look at the pens, notepads, and paper. We'd all have fun, and I could get some great different colored gel inks for these pens. Flash forward to late afternoon as we're having coffee. I take out the Hi Tec C Coleto refills I bought at Kinokuniya and compare one to the Xeno I brought along. 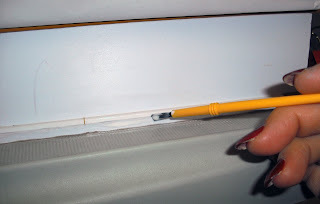 The Xeno ballpoint refill is longer, and no amount of fiddling will get around the fact that the gel ink refill is too short to be pushed out of the barrel. This ended abruptly when the gel ink refill flew apart, splattering my face with blue-black ink. We laughed and went on our way. But I could not get this hack out of my mind. Somehow I had to extend the length of the refill in order to push out the plastic cap that fits into the barrel. Suffice to say after a few false starts (Q-tips, toothpicks) I found a way to do it, using the sharpened end of bamboo skewers. As seen in the pic to the left, with the red Hi Tec C Coleto gel ink refill, the skewer is inserted into the cartridge and then cut to the same lenght as the ballpoint refill. This hack worked really well, the only slight problem being that the Xeno takes 1.0mm refills and the largest I could get in the Hi Tec C Coleto refill was 0.5mm. But other than looking a tad strange, I have my Xeno pen with a gel ink cartridge. I was definitely intrigued by this notebook pen clip from Charles & Marie, and so I ordered the long clip. The long clip was out of stock until a week or so ago, then I was away for the holidays and so I'm not just taking a look at my packages. Above is the long clip in the spine of a hard Piccadilly journal, with a gelpoint ink pen in the clip. This is a great clip, although it reminds me of a long metal clip used in salons when cutting or blow drying hair. The long back end fits down the spine of your notebook. The shorter top will pull up and the pen or pencil fits in the open oval area, which holds it in place. In this pic the clip is next to a white pencil that came in the package, which gives you a sense of the length. The clip is also available in a shorter version for smaller journals. It won't work with every notebook or journal, the spine has to have an open space for the metal back end to slip into. 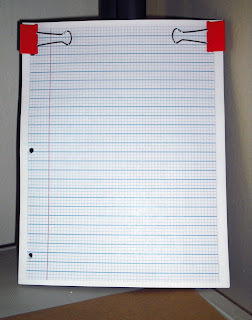 So it's a great idea for hard Moleksines and the like, but not too good for something like a MiquelRius soft flexible notebook. And the price is a tad high, $16 plush shipping. I'm wondering if there wasn't some way to hack a long hair clip? I may stop by my hair stylist or a beauty supply shop to get a better look at these, and start letting the ideas percolate. 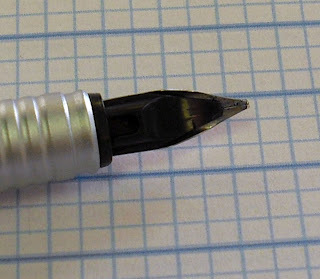 Surfing eBay for interesting (and inexpensive) fountain pens let me to the Mileno Bazic fountain pen, a very basic model with a fine-to-medium steel nib (Lanty). The Bazic takes international-sized cartridges, though it might take a converter but I haven't tried it out yet. The pen itself writes quite nicely, gliding over the Rhodia 80gsm paper with a fairly smooth ink flow. For about $4.30 total, I bought the black model (it also is available in blue and burgundy) and 12 additional ink cartridges. This is the kind of pen and highliter that demands attention. What an amazing marketing tool. I signed up for a four-week Saturday beginner's knitting class in Brooklyn, so I'm off to do my grocery shopping and then head over to the yarn shop. I haven't held a pair of knitting needles in my hands in multiple decades, so I'm excited to re-learn a great craft. To get back into things I bought some crochet needles and yarn and started in on a scarf (above pic). Off to knit, later all. So did we make contact yet? And will I need to add a Space Pen to the collection?